We live in a visual world. I get it. I’m the first to admit that I love looking at logos and the idea that the essence of a company, drink, food, car —almost anything— can be captured in a visual. 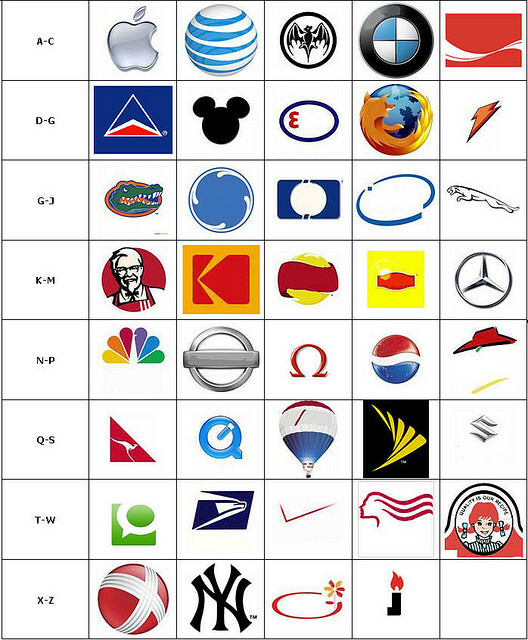 Come on, aren’t you tempted to name the brands pictured here? Hashtags? Great. If only our program could attract thousands of Jewish teens by using #Jteens. The idea of “branding” has been in my airspace for a few weeks. It started when I read a blog about the viral video “Friday” and how it catapulted Rebecca Black and her now ex-friend into instant stardom (not familiar with the story? see wikipedia ). “Greenfield’s Theory of Social Change and Human Development posits that, as learning environments move towards high technology, as living environments become increasingly urbanized, as education levels increase, and as people become wealthier, psychological development moves in the direction of increasing individualism, while traditional, familistic, and communitarian values decline….” (italics mine). So, the desire to individuate comes with the territory. Is it any wonder that this study found that fame grows in prominence as a goal among tweens? If the teen years were tough before, it’s more complicated now. How do we as teachers and parents begin to work through this? I attended a workshop a few days ago sponsored by Moving Traditions and we discussed the fact that teenage girls see themselves as ‘brands’ when posting on their Facebook pages. They think about themselves in the third person and how their presenting image will be perceived by others. They think about how to ‘enhance’ their brand by who they ‘friend’ and the clothes, music, and tech toys they buy, presenting an additional teaching and parenting opportunity. This issue goes across gender and is not limited to teenage girls. Another tongue-in-cheek blog asked whether Rabbis would be more effective if they were ‘pitchmen’ and might be more successful if incorporating brand names into their sermons. I have not worked this all out yet. On one level, I definitely buy into the branding idea and think that we, who work in the world of Jewish teens, could certainly learn a thing or two about ‘branding’ with an image overhaul. If we just had more marketing dollars, or could find a sponsor, or a brand to partner with….oops, there I go again. In this world of visual overload, I am fine with working on communicating a clearer message as long as it’s an authentic one. I guess that’s the advice I would give to a Jewish teen approaching bar/bat mitzvah age as well. Go ahead, think about who you really are. Make sure it reflects your true self, incorporates core Jewish values and ethics, then go ahead, brand yourself as the most special person you are. This entry was posted on Thursday, August 4th, 2011 at 1:00 AM	and tagged with Brand, education, Facebook, Jewish community, Jewish Teens, Jews, Judaism, Religion and Spirituality and posted in Adolescence, Jewish Education, Jewish Teens, Judaism, Parenting, Teens, Youth. You can follow any responses to this entry through the RSS 2.0 feed.